If Makise Kurisu were to hear about a site where people vote on how moe she is, she would immediately launch a denial of service attack on its server. And blush furiously. And deny doing it. It is therefore for the better that Kurisu remains unaware and can concentrate on revolutionizing the world with her research. 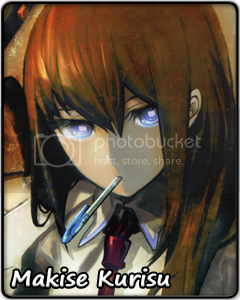 Perceptive and bright, Kurisu takes on mysteries of science that have baffled the great minds of previous generations... and solves them one by one. It is hard work, involves hours spent mulling over complex formulas and allows for little to no beauty sleep, but you get bragging rights once everything falls neatly into place. And you can wear a cool lab coat, too. When too tired for productive thinking, Kurisu joins the anonymous hordes roaming Internet forums. More honest with herself when nobody can see what she is doing, Kurisu enjoys discussing the same rumors and theories she rejects as silly when talking in 'real life'. She is fluent in all kinds of Internet lingo and metaphors, and often perceives the world around in terms of various memes... but nobody will ever find out, right? As much as she would like to appear perfect, Kurisu has her own weaknesses and vulnerabilities. But when somebody is needed to whip a group of good-for-nothings into saving the world, she is as good a candidate as they get.